Looks like the solid basis for an argument that capitalism causes social pathologies and mental instability and a spectrum of mental illnesses, is cannibalistic, predatory and a cult in need of an entire series of interventions, an extended treatment under restraints, and input from ALL of those who have been systematically marginalized in this self-destructive gluttony. The system, in its vituperative condemnation of the critiques by Marx, has, most ironically, proven it accurate down to finely granular minutiae. But it can’t seem to see it. Perhaps they eyes have been rolled back for far too long. That would explain the constant re-walking of the dead end alley and knocking its head against wall at the end. All the trump regime diversions in funding from human needs to more obscene military spending and years/decades of blatant evasion of taxation by America’s corporations affects every American of modest means…the “little people”! The diversion of resources and evasion of taxation - Amazon, made $11.2 Billion in profits in 2018 alone and paid ZERO in federal taxes over the past two years - those revenues used to fund education and other human needs but under the trump regime (and previous complicit administrations), those “revenue sharing” funds were used for crony profits, corporate welfare, and the war-machine, not the people! The affect is felt at the state level in sky-high “fees”, property taxation to fund public ed that robs from the most vulnerable to make-up for the diversion and theft of billions and trillions at the federal level by the wealthiest/greediest - much going to crony "independent contractors, corporations and arms manufacturers, beside to endless wars themselves. “$21 trillion in unauthorized spending in the departments of Defense and Housing and Urban Development for the years 1998-2015” - where did it go?! A nation like our republic is not made “great” by such organized theft, it is made weak and its masses poor and puts millions in jeopardy of loosing everything! “Every gun that is made, every warship launched, every rocket fired signifies, in the final sense, a theft from those who hunger and are not fed, those who are cold and are not clothed. This world in arms is not spending money alone, it is spending the sweat of its laborers, the genius of its scientists, and the hopes of its children!" - A future now under serious threat by greed and self interest at the grand theft of trillions from our civilian society! "The military is the nation’s largest and most firmly entrenched entitlement program, one that takes half of every tax dollar." Remember, our overly funded military can’t even win a war against a country that doesn’t have an organized military. Winning the war isn’t the goal. 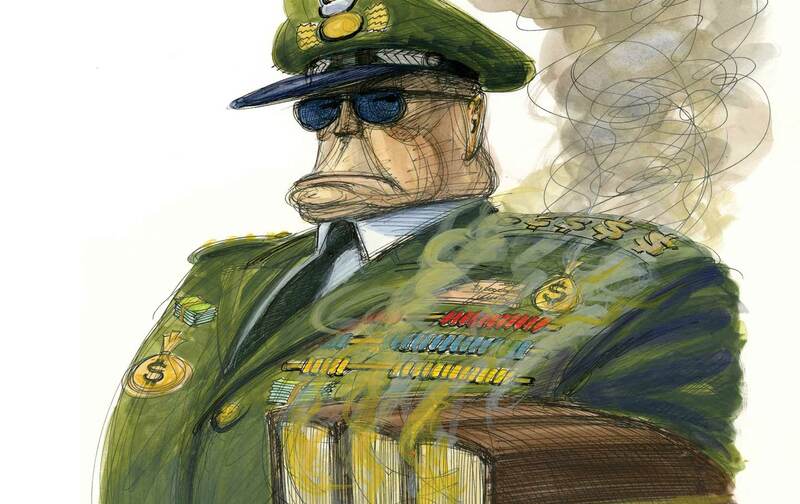 Military contractors getting rich from tax dollars is. All thanks to the SCOTUS for making these corporations people vis citizens united. Personally, I will believe that these corporations are really people immediately after the state of Texas executes one of them.